WHAT I SAW AND HOW I LIED by Judy Blundell has won the National Book Award for Young People's Literature. I have to admit I'm shocked. Of the five finalists, I actually thought WHAT I SAW was the least likely to win. It hasn't received the kind of rave reviews or internet chatter that some of the other nominees have enjoyed. In fact, I expected that many people would be surprised to see that I ranked it so highly (#2, just behind CHAINS) on my personal list of favorites in yesterday's blog. This unpretentious novel didn't try to wow us with showy, highly stylized writing. Instead it was simply a good story well-told and, as I stated in yesterday's blog: there is absolutely nothing wrong with that! 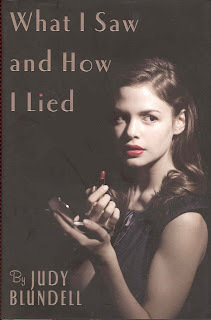 Congratulations to Judy Blundell and WHAT I SAW AND HOW I LIED.